Context - With the growing use of energy saving lamps and the development of new lighting technologies, comes the worry that some people who have conditions that react to light might be negatively affected by this shift. Can these new artificial light sources affect the health of the general public or of light-sensitive people? Artificial light is composed of visible light as well as some ultraviolet (UV) and infrared (IR) radiations, and there is a concern that the emission levels of some lamps could be harmful for the skin and the eyes. Both natural and artificial light can also disrupt the human body clock and the hormonal system, and this can cause health problems. The ultraviolet and the blue components of light have the greatest potential to cause harm. 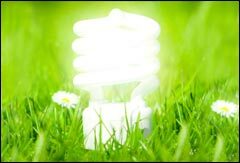 Some people with diseases that make them sensitive to light claim that the energy-saving lamps (mainly compact fluorescent lamps (CFLs) and light emitting diodes (LEDs)) that have been brought to replace incandescent lamps, make their symptoms worse and play a role in a wide range of diseases. They also argue that protective measures such as covering the lamps with a second glass envelope (which decreases the UV-emissions), are ineffective. Metal halide lamps can pose a risk if used close to the skin, but they are not intended for that. Humans have long created artificial lights by burning or heating materials, and candles as well as other flame operated lamps are still in common use today. The advent of electricity brought incandescent lights where typically a metal filament is sealed inside a glass tube and electricity is used to heat up the metal until it glows. These are the traditional light bulbs that have been in use for many years but are now being phased out in favour of more energy-efficient lights. Halogen lamps follow the same principle but they also contain a gas inside the tube that makes the light much brighter and the lamp more efficient. Electrical discharge lamps produce light by sending an electric current through a gas. The basic design is also a gas sealed inside a tube but there are many different variations. Some lamps keep the gas at low pressures and the most common example of this type are fluorescent lamps. High-pressure discharge lamps produce brighter light and are used to illuminate large buildings, in TV or film making and for street lighting. Solid state lighting is a new technology that could be the main artificial light source in future. Light-emitting diodes (LED) are well known and already in use but new types of lamp are being developed. Radiation levels decrease with distance to the lamp, so to ensure the lamps safety for the eyes and skin they are tested in the worst case scenario of the lamp being at a distance of only 20 cm. Based on these standard tests the lamps were classified into four Risk Groups: “exempt from risk” (RG0), “low risk” (RG1), “medium risk” (RG2), and “high risk” (RG3) which includes only lamps where a short-term exposure poses a threat. The sun and lamps emit visible light and invisible radiations, such as ultraviolet (UV) and infrared (IR). The wavelength of visible light determines its colour, from violet (shorter wavelength) through to red (longer wavelength). UV and IR can be subdivided according to their wavelength into narrower bands (UVA/UVB/UVC for ultraviolet, with UVA being the closest to visible light, and IRA/IRB/IRC for infrared, with IRA being the closest to visible light.). The sun emits radiation over the full range of wavelengths, but the earth’s atmosphere blocks a lot of UV and infrared radiations. The effect of light on cells depends on the radiation and its wavelength, the type of cell, the chromophore, and the chemical reaction involved. When light illuminates matter it can heat it up, and this is the main effect of IR. Visible and UV light can also start chemical reactions if they reach appropriate absorbing molecules called chromophores, and these are very abundant in skin and eye cells. Visible and IRA radiations penetrate deepest into the skin and eye and can reach as far as the retina. UVC, IRB and IRC penetrate the least. Visible and IR radiations from artificial lights are unlikely to have any effects on health, unless they are extremely intense and used at close range. Overexposure to UV causes burns in the short term and, over long periods of time, contributes to the risk of developing skin cancer (melanoma) as well as squamous cell carcinoma (SCC) and basal cell carcinoma, (BCC). According to a worst case scenario the highest measured UV emissions from lamps used in offices and schools, but not the very low emissions lamps used for household lighting, could add to the number of SCCs in the EU population. There is no evidence that short-term exposure to lamps used normally in offices or at home would cause any damage to the eye. The blue component of visible light can harm the retina but this is only caused by accidental exposure to sunlight or to very high intensity artificial lights so is rare. There is no consistent evidence that long-term exposure to blue light at lower intensity causes any damage to the retina. Long-term exposure to UV from sunlight may damage the cornea and cause cataracts but using artificial light normally is very unlikely to have any similar effects. Most people with skin conditions that make them sensitive to light find that sunlight brings on symptoms but some of the most sensitive patients also react to artificial light. The blue or UV component of light are particularly effective at aggravating the skin lesions of chronic actinic dermatitis and solar urticaria, and in the case of lupus erythematosus they make worse both the skin reactions and the disease itself. It is estimated that 1 in 3000 people in Europe is affected by such conditions. These patients should avoid light sources with UV emissions. For instance, if they use CFLs it would be better if they used those with a double envelope. An even better option for some people might be LEDs, because they do not emit UV. The effect of light on patients with eye conditions that are sensitive to light, varies widely from one person to another, depending on their genetic makeup. All patients with retinal dystrophy should wear special protective glasses that filter harmful wavelengths. Short-term UV effects from artificial lighting on healthy people are thought to be negligible. It is not possible to assess long-term risks because there are no exposure data but one can make estimates considering a worst-case scenario. This assumes typical exposures at work and in school to CFLs with the highest level of UV radiation, although in practice, exposure to fluorescent lamps will be lower than this. The effects of short-term exposure to UV from artificial light are negligible. Long term exposure to low levels of UV radiation add a very small percentage to the lifetime risk of developing squamous cell carcinoma (SCC) but could lead to an increase in the number of SCCs in the population. Some people have conditions that make them exceptionally sensitive to light. Sunlight seems to be the main trigger of disease but artificial light also plays a role in some cases. Manufacturers should give detailed information on the light emitted by each model of lamp, so that patients and their doctors can choose the lamp that suits them best. Patients with retinal dystrophy should wear special protective eyewear that filters short and intermediate wavelengths.